The LBS research agenda aims to motivate further LBS research and stimulate collective efforts, with the goal to “positively” shape the future of the mobile information society, into which our society is evolving. It identifies a list of key research challenges within the scientific field of LBS. As the research agenda isn’t set in stone, you are encouraged to provide comments here (will open a new web page). 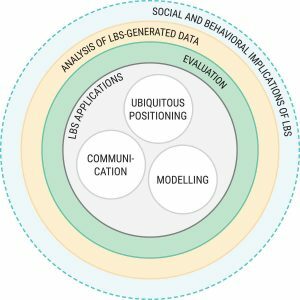 Location Based Services (LBS) have become a research field since the early 2000s. Since that time, there have been many changes in the field, especially concerning, e.g., the increasing demands in expanding LBS from outdoor to indoor, from location-aware to context-aware, and from navigation systems and mobile guides to more diverse applications (e.g., healthcare, transportation, gaming), as well as the appearance of new interface technologies (e.g., digital glasses, smartwatch, augmented reality devices), and the increasing smartness of our environments and cities (e.g., with different kinds of sensors). At the same time, we have seen more and more LBS are entering general public’s daily life, which greatly influences how people interact with each other and their behaviours at different environments. It also brings many opportunities (e.g., for city administration and urban planning, big data) and challenges (e.g., privacy, legal and ethical issues, the “side effects” of technology) to our planet and human society. These changes open up a lot of basic and applied research questions to the LBS research community. As a first step, everyone was invited to write a one or two paragraph proposal to describe what she/he believes are the “big problems” that should be addressed to bring LBS into a higher level, and why (optional). The deadline was 5 August 2016. In total, we received 31 one-paragraph proposals. Please have a look at all the proposals here (PDF). On August 2016, based on the 31 proposals, we compiled a first list of “key problems” (PDF). This list was published at the Commission website (here) to seek comments and feedback. A workshop was organized on 13 November 2016 at 13:30-18:00 in Vienna (Austria) to refine and improve the list of “key problems”, immediately before LBS 2016. In total, 22 participants joined the workshop. On 3 July 2017, another dedicated session at ICC 2017 (Washington DC, USA) was organized to further discuss the list of “key problems”. A revised list of “key problems” (PDF), based on the comments/suggestions of the workshop and conference session, was published in July 2017 at the Commission website. In the 2nd half of 2017, the Commission chairs together with several invited experts summarised all the “key problems”, and prepared a draft manuscript. The manuscript also provided a state-of-the-art review of the scientific field of LBS. The manuscript was submitted to the Journal of Location Based Services (JLBS) for double-blind peer review. After revision, the manuscript was then accepted and published in JLBS as an open access paper. The following researchers contributed one-paragraph proposals of “big research questions in LBS”: Klemen Kozmus, Domokos Esztergár-Kiss, Eko Sediyono, Kai-Florian Richter, Dirk Wenig, Christian Kray, Peter Kiefer, Max Pfeiffer, Ioannis Giannopoulos, Matthias Seuter, Champika Manel, Sebastian Feld, Martin Werner, Pavel Andreevich Samsonov, Johannes Schöning, Jürgen Döllner, Jochen Wendel, Rui Li, Huanfa Chen, William Mackaness, M.R. Malek, Catia Real Ehrlich, Jörg Blankenbach, Bonan Wei, Jochen Schiewe, Liqiu Meng, Min Lu, H. Sebnem Duzgun, David Jonietz, Dominik Bucher, Stefano De Sabbata, Andrei Popleteev, Thomas Liebig, Peng Jia, Johannes Scholz, Nina Polous, Guenther Retscher, and Konstantinos Papangelis. Additionally, we also appreciate the comments and feedback provided by participants of the “Research Agenda” workshops at LBS 2016 and ICC 2017, particularly: Johannes Schöning, Pavel Samsonov, Mohammad Reza Malek, Dominik Bucher, Sebastian Feld, Guenther Retscher, Rui Li, Edward Verbree, Karl Rehrl, Aleksander Ozga, Gyözö Gidofalvi, Pia Bereuter, Karel Staněk, Conrad Franke, Lucas Godfrey, Liqiu Meng, Dariusz Gotlib, William Mackaness, Bo Zhao, GenGen He, David Fairbairn, and Keith Clarke.